The five Arctic coastal nations are all parties to CITES (the Convention on International Trade in Endangered Species of Wild Fauna and Flora). However they hold different views as to whether the polar bear should be uplisted from Appendix II to Appendix I. The United Sates, with the support of Russia, has proposed that the species be up-listed. Canada, Denmark, and Norway say that current protection measures are more than adequate. Animals and plants listed under Appendix II are “not necessarily threatened with extinction, but in which trade must be controlled in order to avoid utilization incompatible with their survival." Those listed under Appendix I are said to be “threatened with extinction” with trade of specimens “only permitted in exceptional circumstances." Markus Dyck, a polar bear biologist employed by the Government of Nunavut and resident of the Canadian Arctic community of Igloolik offers his views on the question of whether the polar bear should be uplisted, as well as his thoughts on how the media and advocacy organizations are approaching the issue. What is the rationale behind the argument against up-listing polar bears from Appendix II under CITES to Appendix I from a cultural, economical and conservation perspective? It is worth mentioning that the CITES Secretariat, TRAFFIC, WWF, Polar Bears International and various other organizations have recommended that polar bears do not meet the necessary criteria for an up-listing to Appendix I.
I don’t believe that there should be an immediate conservation concern regarding polar bears. Global polar bear abundance has not changed dramatically over the past 10-15 years; polar bears are still found throughout their circumpolar range; and most importantly, trade is not the real issue of concern, which CITES is supposed to control and regulate. The issues are climatic changes that affect the sea ice – whether that is caused by anthropomorphic actions or others can be debated. 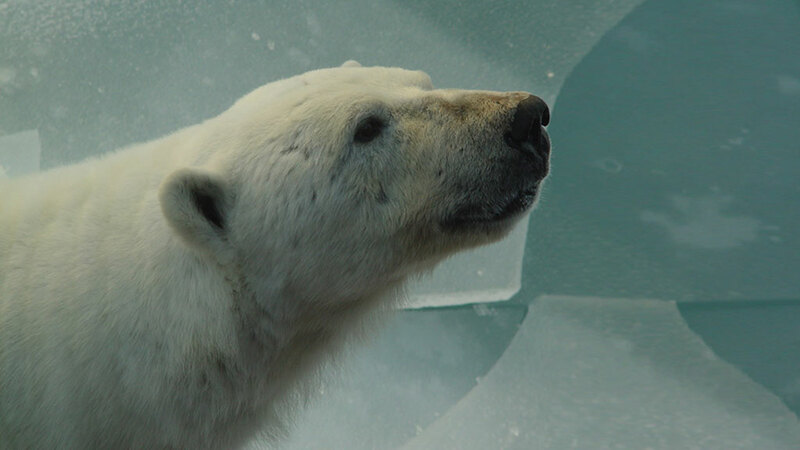 Nevertheless, the energy of advocates that is being put towards conserving polar bears should rather be spent partially on convincing politicians to deal with the real causes of climate change. What is also important is educating our young generations with respect to environmental stewardship, and encouraging common citizens to do their part in being more environmentally aware and sensitive. There should be no debate about what causes climate change. We as humans have to realize that we have not been living up to being great stewards of our environment at all. We pollute, extract, use, pilfer and pillage our planet – for profit that is made by a few at the expense of the majority of citizens and the environment. If polar bears are not up-listed to Appendix I, regulated trade will still be possible for Inuit communities in the Canadian Arctic. Polar bear hides could still be exported out of Canada to provide important economic revenue and opportunities for individuals to employ locals in polar bear sport hunts, as well as feed the community at large. This is not a rationale, but a by-product that would be removed if polar bears were up-listed to Appendix I. In your view,what could be potential repercussions, on the local, regional, national and international level, if polar bears were to be up-listed to Appendix I? I think that the biggest potential repercussions will occur on a territorial level, specifically within Nunavut; and with that it will have effects on most of the word’s polar bears since Nunavut has about 60% of them. Inuit hunters/communities in Nunavut have been obeying polar bear quotas, management plans, etc. since the mid-1960s. Since the time when Nunavut became a Territory, co-management partners have been working together diligently under a conservation regime that is flexible, and incorporates science and traditional local knowledge. Over the years, the voices and pressures from southern advocates that only “know” about polar bears from other advocates’ reports, or the media exaggerations, have made it very difficult for regional/local scientists to work under this regime, and to maintain trust. Especially when the rest of the world believes that there are almost no polar bears left, and Nunavummiut (Nunavut residents) who live with polar bears try to explain that our polar bear populations are still doing fine at present. It is almost as if nobody wants to believe the people who spend most of their lives living with polar bears. One can imagine that this creates hostility and frustration. Changes in the environment are apparent – there is perhaps no Inuit who will deny that. It is also clear that Inuit care about the well-being of our polar bear populations. If, however, southerners, Europeans, and those from many other countries make important decisions about polar bears without believing what we are saying, then I feel that our management efforts could become futile, and hunters will not see the point of following territorial or any other management agendas. Very likely they will feel betrayed. This is unfortunate, because the people that have been co-management partners for so long will be alienated. 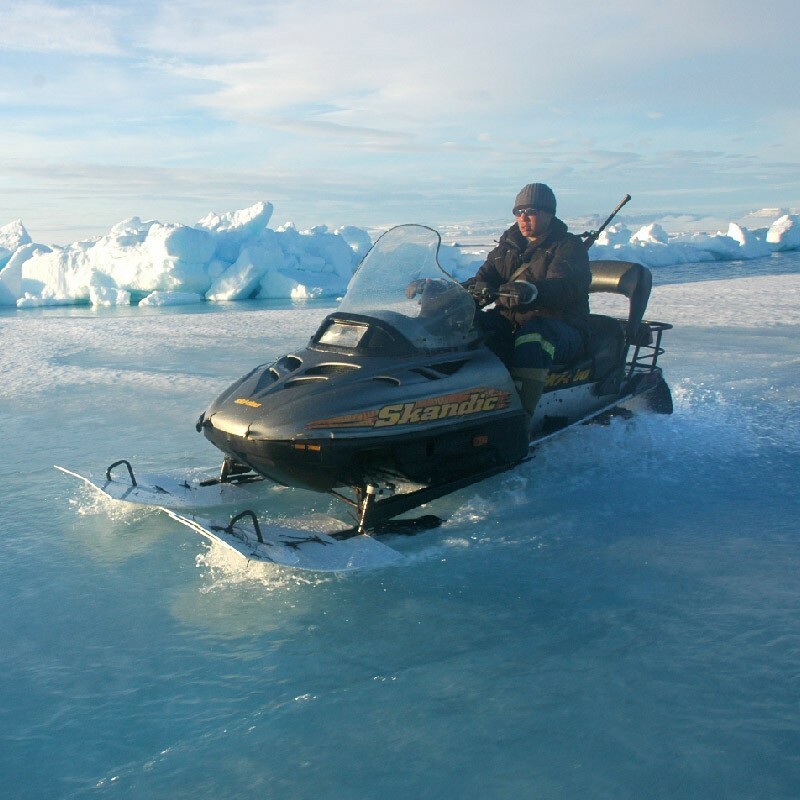 Climate changes are felt in Nunavut; they are real, and as I mentioned, Nunavummiut will agree they are happening because they experience them every time they go hunting, or travel on the ice. Sea ice distribution has been changing, thickness of ice and timing of ice formation/melting is changing, and many of the known skills learned from traditional stories and experience have become hard to apply because of the uncertainties and unknowns in the environment. Much of what the media currently portrays as a major crisis with respect to sea ice and polar bear population abundances is based on computer models that contain many uncertainties. 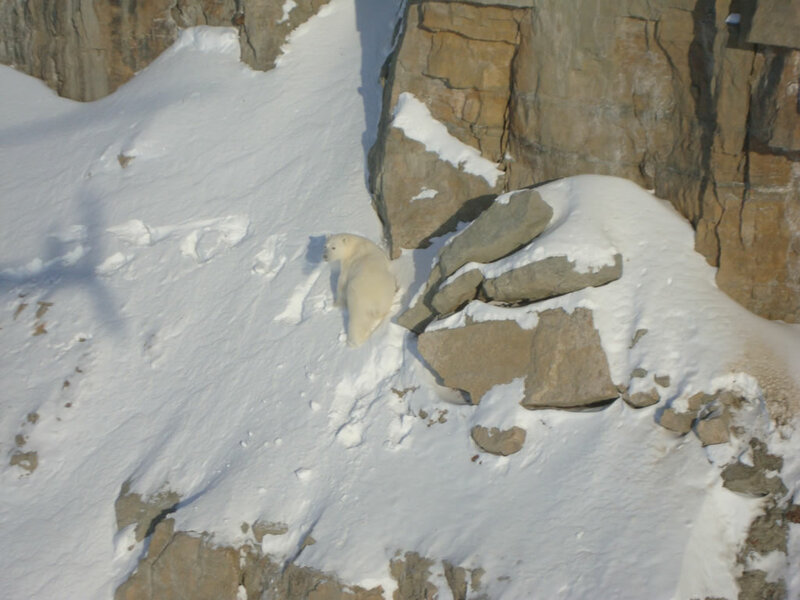 Hunters in Nunavut will agree that if sea ice declines more, fewer polar bears will have access to seals in the future and populations will likely decline. It is also quite clear that demographic responses of polar bear populations in the future will not be the same across their range – although a more uniform decline everywhere is mostly predicted. But the key words here are “the future.” We are not sure when this will happen. Some models predict that 2/3 of the world’s polar bears will be gone by 2050. When we listen to southern biologists preaching that the western Hudson Bay population is continuously declining, but hunters see many bears, and our government conducts a study and finds 1,000 bears, then it is no wonder that some animosity exists between various northern and southern groups. But in the end, we all have a common goal: we want to have polar bears around for many years to come. If sea ice cover continues to decline and if it disappears altogether in summer as some models predict, do you think it might ever become necessary to introduce further protections for polar bears? At what point would the situation become significantly worrisome to warrant further protection? Polar bears in Canada are listed under the Species at Risk Act as a species of special concern. In some jurisdictions, additional protection is given to polar bears through provincial endangered species legislation. In addition, there is the Committee on the Status of Endangered Wildlife in Canada (COSEWIC), which assesses species on a regular basis, and other regulations exist that control the import and export, or trade of the the animal. Moreover, there are several national technical and advisory committees that are also concerned with polar bear management and their status. These committees collaborate, exchange knowledge, and provide advice on a regular basis. Polar bear conservation efforts have been a tremendous success story, but we have to be realistic about what the specific management goals of the various jurisdictions and user groups are. Considering the numbers of polar bears, are there also sufficient numbers of seals to support them, and if we manage to increase the polar bear numbers, when are carrying capacities of ecosystems reached? Is the goal to further increase populations, or to maintain them? These questions become philosophical, and answers likely vary depending on whether one asks a person in Europe, or “south of 60”; or if the person responding lives with polar bears year-round in polar bear country. Nevertheless, I think that there is sufficient legislation protecting polar bears in the long-term. On the other hand, we have to ask ourselves when are climate change policies going to be enacted, followed, and enforced in various countries that contribute the most to environmental degradation and greenhouse gas emissions. These are the real issues of concern that politicians have neglected out of fear of lobbyist groups, re-elections, power struggles, egos, and various influential industries. Most importantly, we need people to make decisions with their head, and not their heart. In your opinion, how much of what the media says about threats polar bears face is based on fact and how much is exaggeration? For years the media has been fed specific information from advocates (including scientists), animal welfare groups and other activist organizations. Most of that information has been dramatized, sensationalized, and exaggerated because the media has failed to properly fact-check where the information is coming from. Even if the sources are scientists, possible biases are ignored. The general public relies on the media for information; most people do not have the time to fact- check what is in the news, or to read scientific papers and investigate technical reports. Therefore, the onus is on the media to report fairly, truthfully, and accurately. So the media – as well as some scientists and polar bear biologists – have crossed the line from objectivity to subjective advocacy. Much of what has been reported in the media about polar bears lately is based on how emotions can be evoked from readers (by showing video clips of how polar bears eat a cub, for example) rather than stimulating intellectual debates. In many cases, reports are published by individuals and organizations that are situated in the south, and they spend only a few weeks per year in the Arctic. And then they make claims about how familiar they are with the Arctic as a whole, or how they know everything about polar bears in the world. There is very little counterbalance in reporting by the media, and effectively whoever “squeaks the loudest” gets their attention. Thanks to effective advertising and media campaigns, misinformation and exaggeration have become so bad that even southern Canadians believe that there are hardly any polar bears and sea ice left in our Arctic – and if there are bears left, they are skinny and attacking and overrunning northern communities. Every event, every anomaly and variation in the environment, is now being attributed to climate change. There is nothing wrong with caring about the environment; however, the attention to the real issues is diverted to polar bears and predicted sea ice scenarios that contain uncertainty. I am not a climatologist, and I don’t even want to try to understand the complexities of modelling climate and climate change. What I know is that humans have become animals of comfort and luxury; people like to be involved in conservation to make themselves feel good, but very few are willing to ride a bike to work, curb their greenhouse gas emissions, be more conscious about water use, and recycle whenever they can to reduce resource use. This is how people can help our environment; this is how world citizens can become world stewards. Making decisions with the heart may be fruitful to organizations that attempt to obtain more sponsors or adoptees for wild polar bears. The real issues and battles, however, have to be fought in your own southern or European backyard, on a local and regional level in order to combat global climate change. However, this would require major sacrifices from every industrialized and developing country and their citizens. Marcus Dyck is a polar bear biologist working for the Government of Nunavut. He is a resident of the Canadian Arctic community of Igloolik, Nunavut.